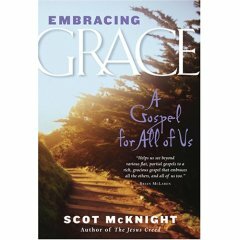 Scot McKnight's Embracing Grace: A Gospel for All of Us is a readable and enjoyable advance in our understanding of "the gospel of the kingdom of God" announced and lived by Jesus. I think it answers many questions raised in conversations today, a primary question being "What is the gospel"? To keep us from reducing "the gospel" down to expressions that fall so short of the expansive grace of God revealed in Jesus Christ, McKnight gives us a compelling book, not a marketing pamphlet; a theology, not a ticket out of hell. So, who is this Scot McKnight? Scot is a baseball fanatic, one could say, since his son Lukas is a scout for the Chicago Cubs. He's happily married to Kris who, by the way Scot writes about her, is his favorite companion and travel friend. He's a chef who can prepare fine Italian cuisine ("Risotto al Basilico, anyone?"). He was, in his younger years, the star basketball shooter for what is now Cornerstone University in Grand Rapids, MI (just ask his coach Gary Raymond). He's an aficionado of fountain ink pens ("a fine Pelikan Piazza Navona, anyone?") He is an author, cranking out more good books than Shaklee does pills. And to my way of thinking Scot is "a new kind of scholar"-- a respected scholar who has not lost sight of the ordinary guy or girl who is trying to follow Jesus. I don't think Scot has ever seen the proverbial "ivory tower" that he's supposed to live in. Scot is a theologian for the street, for the corner market, the college campus, the little church hidden in the high corn of Iowa. But don't be fooled by this casual demeaner because with a little flick of his fountain pen, McKnight can skillfully joust with the best of the Jesus scholars and New Testament studies geeks. McKnight is presently the Karl A. Olsson Professor in Religious Studies at North Park University (Chicago, Illinois), where he is also the Department Chair and the Director of the College of Christian Life and Thought. Scot obtained his Ph.D. at the University of Nottingham (1986). McKnight is a member of the Society of Biblical Literature and the Society for New Testament Studies. He is the author of more than twenty books, including the award-winning The Jesus Creed: Loving God, Loving Others (Paraclete, 2004), which won the Christianity Today book of the year for Christian Living. His most recent books include Embracing Grace: A Gospel for All of Us (Paraclete, 2005), The Story of the Christ (Baker, 2006), and Praying with the Church (Paraclete, 2006). He has a new book (see!) coming out in November called The Real Mary: Why Evangelical Christians Can Embrace the Mother of Jesus. Other books include Jesus and His Death (Baylor, 2005), A Light among the Gentiles (Fortress, 1992), A New Vision for Israel (Eerdmans, 1999), Turning to Jesus (Westminster John Knox, 2002), Galatians (Zondervan, 1993) and 1 Peter (Zondervan, 1996), Interpreting the Synoptic Gospels (Baker, 1988), and he is a co-editor with J.B. Green and I.H. Marshall of the award-winning The Dictionary of Jesus and the Gospels (IVP, 1992) as well as the co-editor, with J.D.G. Dunn, of The Historical Jesus in Current Study (Eisenbraun’s, 2005). He regularly contributes chapter length studies to books and articles for magazines and online webzines. Scot's books have been translated into Chinese, Korean, and Russian. So what's Scot up to in his book Embracing Grace? Prologue-- "It [the gospel] does not belong to one and only one denomination; it belongs to the whole church." "An undeniable feature of the attractiveness of Jesus is that he wasn't distracted by endless debates about theories: he rolled up his sleeves and invited people to join him in his vision for the kingdom of God. ... The gospel is good enough on its own, and it doesn't need to be propped up with proofs. Stories are like that. No one needs to prove that the...Lord of the Rings or Charlotte's Web are good stories." Introduction-- "So, how would I define the gospel? The gospel is the work of God to restore human beings to union with God and communion with others, in the context of a community, for the good of others and the world." God embraces the whole created order. We embrace the entire created order. The gospel is designed to create this cycle of grace." I'm glad you're reviewing this book. Great to get your take on it. I need to re-reread it (will be third time). It's my favorite book on the gospel. I do like Scot's expression of the gospel. I would suggest that it is impossible to "embrace" Grace. "Who" is going to "embrace" Grace? Grace is entirely and only a Divine Gift which can only be responded to. See for instance. I think you'll find Scot's book compelling. Your idea that grace "can only be responded to" is not opposed to Scot's idea of "embracing."